Robert Rauschenberg (1925–2008) was a breaker of boundaries and a consummate collaborator. He used silk-screen prints to reflect on American promise and failure, melded sculpture and painting in works called combines, and collaborated with engineers and scientists to challenge our thinking about art. Through collaborations with John Cage, Merce Cunningham, and others, Rauschenberg bridged the music, dance, and visual-art worlds, inventing a new art for the last half of the twentieth century. Robert Rauschenberg: An Oral History is a work of collaborative oral biography that tells the story of one of the twentieth century’s great artists through a series of interviews with key figures in his life—family, friends, former lovers, professional associates, studio assistants, and collaborators. 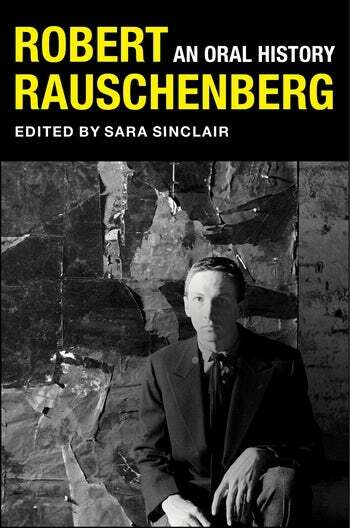 The oral historian Sara Sinclair artfully puts the narrators’ reminiscences in conversation, with a focus on the relationship between Rauschenberg’s intense social life and his art. The book opens with a prologue by Rauschenberg’s sister and then shifts to New York City’s 1950s and ’60s art scene, populated by the luminaries of abstract expressionism. It follows Rauschenberg’s eventual move to Florida’s Captiva Island and his trips across the globe, illuminating his inner life and its effect on his and others’ art. The narrators share their views on Rauschenberg’s work, explore the curatorial thinking behind exhibitions of his art, and reflect on the impact of the influx of money into the contemporary art market. Included are artists famous in the own right, such as Laurie Anderson and Brice Marden, as well as art-world insiders and lesser-known figures who were part of Rauschenberg’s inner circle. Beyond considering Rauschenberg as an artist, this book reveals him as a man embedded in a series of art worlds over the course of a long and rich life, demonstrating the complex interaction of business and personal, public and private in the creation of great art.